I do love a good surprise! Yesterday my husband spent the night with his aunt and uncle. After work, he drove straight to their house. The evening prior, knowing us girls would be all alone, he moved Karalee’s twin mattress into our bedroom so we three girls could sleep in one room while he was gone. That meant him sleeping on Katelyn’s bed the evening before he left … and us girls had two nights in one bedroom together. The girls love that! Slumber party! The evening before he left, he went to the store after we girls were already tucked safely in bed. Karalee happened to get up and noticed him gone. Nothing gets past Karalee! 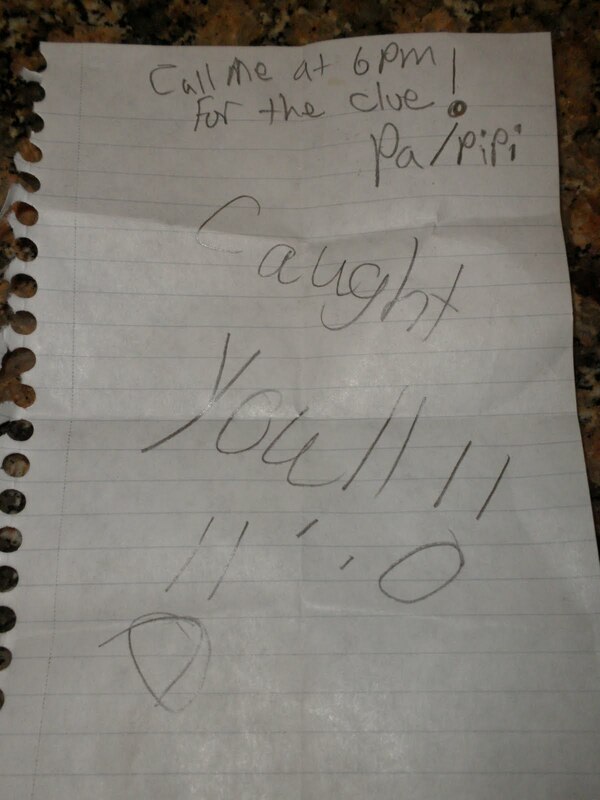 I told her to leave him a note saying, “Caught you!” She did. We fell fast asleep. We did exactly that. Both girls crawled up into my lap, and we followed his instructions. Nothing came to us. We thought, “It couldn’t be watching Alice in Wonderland … we’ve seen it a dozen times … that would be nothing new and exciting.” I thought, maybe he wants us to rent the movie Rango that has Johnny Depp in it. But when I asked him about that, he said “No.” Plugged In with Focus on the Family gave Rango not-so-good reviews, so we have yet to see it. We were at a loss. Finally, we get up and start snooping around the entertainment center … looking for any clue. Nothing. I reached way up high and felt … nothing. I walked into my room. In a minute, I hear, “Mom … I found it” from one Karalee! 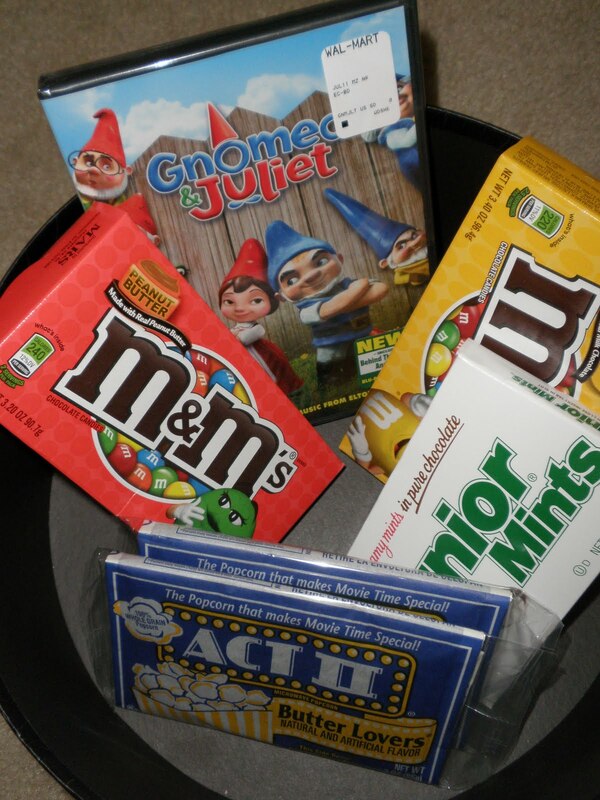 I walked in to find her with a hat box open … the movie Gnomeo and Juliet, popcorn and three boxes of candy (peanut butter M&M’s, peanut M&M’s and Junior Mints)! We love chocolate, so that by itself was a wonderful surprise! I texted him and wrote, “You have two very smart little girls.” He immediately called to see if we had found it. Then let us know we still had to wait till 6pm to see the movie! Ha!! (His way of providing us entertainment in his absence) At that time … I still had no idea how the present had anything to do with “Mad Hatter.” So I asked him. 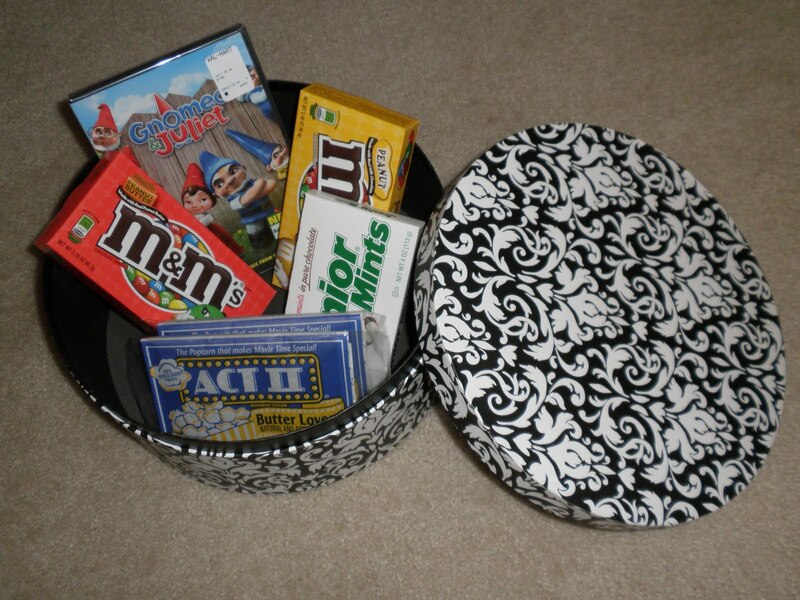 He said, “I put it in the hat box!” Silly me!! Okay, I get it now! I may be a bit slow … but I’m not slow at realizing I have one sweet husband, and I cherish the silly rascal! He is my Romeo.